While most cities around the world see April 23rd as just another day of the week, Catalans hold the day on a high pedestal trimmed with roses and literature. El Día de Sant Jordi, also known as Saint George’s Day, is celebrated with one of the most important and popular festivals in Catalonia, and especially in Barcelona. Known as a “Valentine’s Day” of sorts for the people of Barcelona, La Diada de Sant Jordi is absolutely incomparable to the typical festivities seen on February 14th. The festival is held in commemoration of the patron saint of Catalonia, Saint George. The saint allegedly slew a dragon just south of Barcelona, which was about to kill a beautiful princess. Once the dragon died, a rosebush sprouted from its blood, and Sant Jordi picked and delivered a rose to his princess. In commemoration of this heroic event, men throughout Catalonia buy their ladies flowers, traditionally roses, to show their adoration and love, just as Saint George did. In 1995, April 23rd was named World Book Day in honor of great authors such as Miguel de Cervantes and William Shakespeare, who both died on this day in 1616. 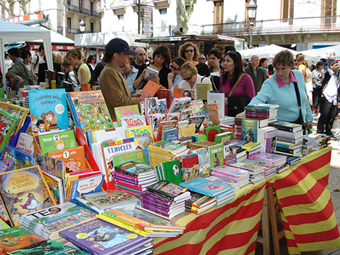 But long before this, in the 1920s, booksellers in Spain had made the connection, and began to promote their sales through the Diada de Sant Jordi. So, in return for their roses, women presented books to the men they love. This tradition is a now a huge part of the Sant Jordi celebrations. 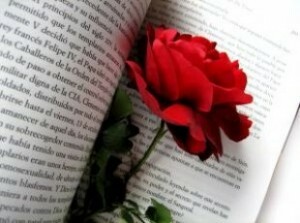 On the Día de Sant Jordi itself, over 4 million roses are sold, as well as around 400,000 books. Makeshift book stalls and flower stands line Las Ramblas and authors come to sign their work. Even though April 23rd is in fact still a work day, many Catalonians find the time to wander the streets and buy books, flowers, and even listen to readings of Don Quijote. Throughout the entire city you can see new partners, elderly couples, and even friends exchange copies of Spanish literature for beautiful bouquets of different colored roses. 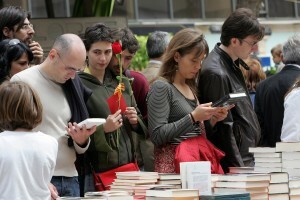 Though considered the most amorous time of the year in Barcelona, La Diada de Sant Jordi is more than just a “lovefest”. The atmosphere on April 23rd is filled with Catalan pride, as citizens wave the yellow and red flag, and toast to the region they call home. 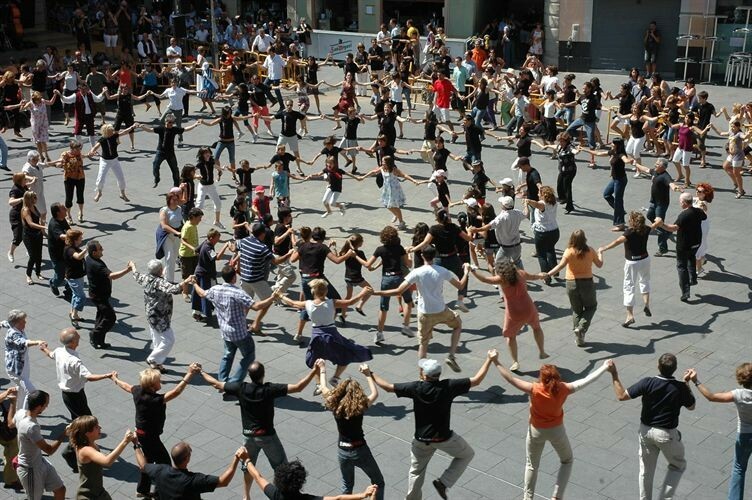 The traditional dance, la Sardana, is performed around the clock by locals of all ages, and curious tourists in the Plaça Sant Jaume. Along with these festivities, comes an opportunity for tourists that you absolutely cannot miss. On this day, the L’Ajuntament, Barcelona’s City Hall, opens its doors to the public – for free! Here, you can catch a glimpse of some incredible architecture and smell the huge displays of roses created in honor of Sant Jordi. If you’re coming to Barcelona, you absolutely cannot miss out on this traditional experience, and you can find many Barcelona apartments available to rent that are located in the center of all the celebrations, on Las Ramblas. Spend the day wandering through the romantic, winding streets of El Gothic, until you reach Plaça de Sant Jaume where you may feel inclined to take part in a bit of Sardana yourself! Later, wander past cafés and book stalls, listening to the authors and their native Catalan tongue. 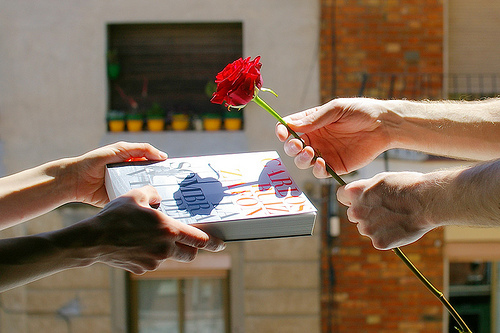 End the day like a true Catalonian, finding the perfect rose or book to exchange with your loved one. 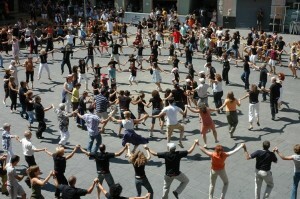 This entry was posted in Activities, Events and tagged Apartment Barcelona, apartment rental, barcelona activities, barcelona apartment rental, barcelona apartments, Barcelona culture, barcelona events, Barcelona festival, barcelona festivals, barcelona traditions, catalan culture, diada sant jordi, luxury apartments, saint george's day. Bookmark the permalink.